I was looking at some of my recent blog posts and was not happy with how my hair was looking in some of the photos. I know I'm probably obsessing, but my feeling is, if my hair doesn't look good, neither will my outfits. I know there are some other hair obsessed lovelies out there that know how I feel, and can relate to my dilemma. So I decided that I would select one product line that would work for all of my hair needs. Now, this task for any normal person would probably be daunting, but for a hair obsessed person such as myself, not so much. All I had to do, was turn to my archives(bathroom closet) of partially used hair products to narrow it down. I remembered I had purchased the Moroccan Oil glimmer shine spray and a small bottle of the Original Moroccan oil, so I started using them again to see if I still liked them as much as I did initially. I did, and my hair is starting to come back to life again. Ding, ding, ding. We have a winner! I have finally found a complete product line that works with my hair type(course and thick). Whoo hoo! It's not like I'm talking about anything new here, Moroccan Oil has been around for quite some time now, but it is easy to get distracted by all of the other products out there, all claiming to do different things. I decided to stick with what I know, and what works. 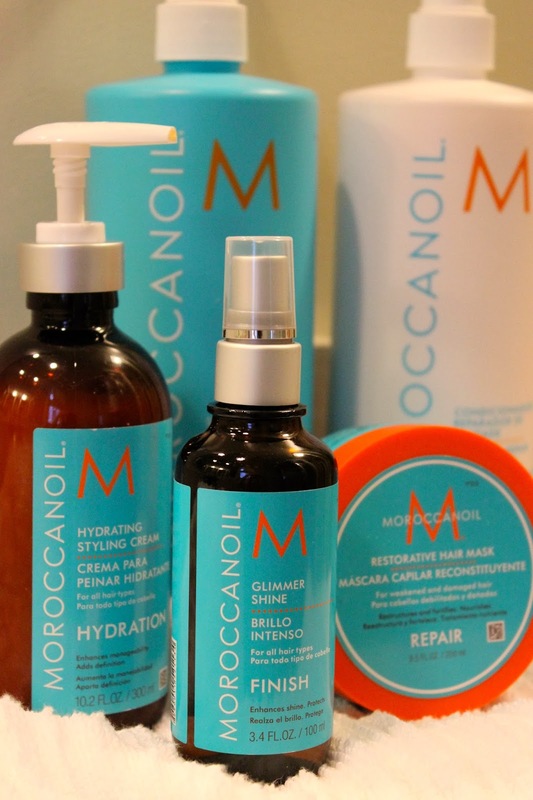 With Moroccan Oil's Repair line, I can start to rebuild my hair from any damage done by coloring, chemically treating, and heat styling. I have only been using it for about a week now, and I have to say, my hair is already starting to feel and look better. I guess the proof will be in pudding, or the photos, in my case. 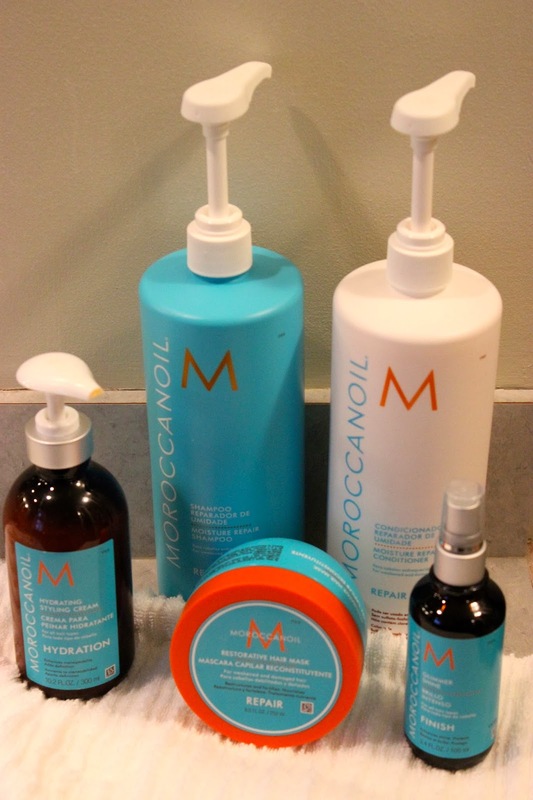 Moroccan Oil is a quality product that delivers immediate and real results. They have very high standards for their product and they can only be purchased in salons(I purchased mine at Panico in Ridgewood, NJ). They honor their commitment to salon professionals by using a unique tracking system that follows each product from it's source, to it's destination. It's pretty impressive, and I also love the fact that this brand was born from a bad hair experience. Talk about making lemons into lemonade! Read more about that here. Currently I am using the Repair shampoo and conditioner along with the Repair restorative hair mask once week. For styling, I am using the Hydrating styling cream and to finish, the Glimmer shine spray. Each of their products has a video tutorial on how to use them, as well as reviews and facts. I will be adding the Frizz control spray once the weather starts getting warmer. I think I am going to skip the Keratin treatment I get once a year to control frizz(sssshhhh! don't tell my stylist). It will be a lot more affordable and healthier for my hair. The moral of this hair dilemma, is to stick to what works. Well, I guess it's time to purge my archives! Disclosure: The opinions expressed herein are those of the author and are not indicative of the opinions or positions of Moroccan Oil brand.